Our talented jewelers are able to create stunning sculpted designs in metal with custom engraving by hand. The process starts out with a general design layout with the shapes/design/motifs desired. 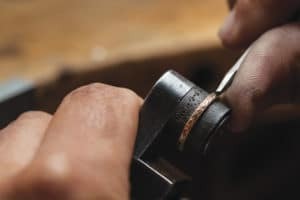 Our jeweler then takes precision hand held engraving tools and carves, shapes and polishes the designs they create in the metal. The results are stunning! House of Diamonds purchased the Vision Max Pro engraving machine which allows a phenomenal array of engraving potential. It can engrave the inside and/or outside of rings and bracelets, as well as flat items like pendants, pins, and watch backs. Its digital software allows us to import a wide variety of fonts and images, and also allows us to replicate specific unique handwriting or signatures and personal logos. Our Vision Max Pro has the ability to engrave wine bottles, wine glasses and other glassware, as well as most glass or metal objects. What better way to commemorate a special occasion or build you own brand with engraving your logo on the item(s) you choose! Many people know that we design custom jewelry. The process of designing and creating custom jewelry requires quite a bit of machinery from casting machines to 3D printing machines. This first example is a custom engraved tumbler manufactured by RTIC. Jason is one of our clients who owns a company called Blue Gurus. He wanted to give these tumblers as gifts to his clients. But he needed his logo engraved on the tumblers to make them a unique and memorable gift. 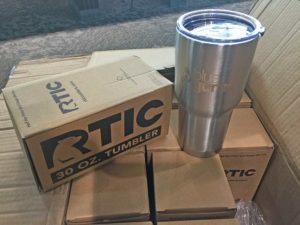 He brought in a case of 30 tumblers and we engraved them all. Jason was really happy with the results and is excited to give them to his best customers as customer appreciation gift. 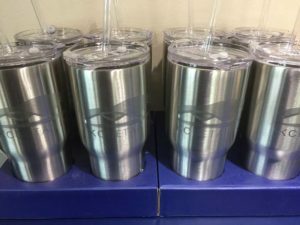 The second example is a tumbler that we engraved for KC Detailing. Jonathon is a friend and client of ours who owns KC Detailing. They do amazing custom detailing and finishing for motor vehicles. We like to do business with the people that also do business with us. We like to keep things local. Both of these projects met that goal. And it’s always fun seeing their faces when they see their custom tumblers for the first time. The Vision MAX Pro Engraver is a versatile machine. It allows us to engrave flat, deep, round or odd-shaped items. The system is frequently used as a glass engraving machine, but its automatic surface-sensing feature allows for flat and curved surface engraving on a wide range of other materials as well, such as plastic, brass, coated and non-coated metals, artificial stone, crystal, and more.